In Tatar cuisine the most widespread second dishes are products from the dough - balesh, gubadija, ochpochmak, peremech etc. And the Tatar cuisine section certainly would be incomplete without recipes of preparation of various kinds of the dough. In warm water (or milk) to dissolve yeast, to put sugar, fat, salt. It is good to mix and pour flour. Knead dough and at 2-3 o'clock to put in a warm place for fermentation. 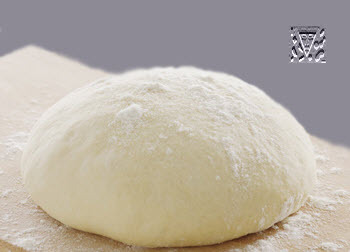 In the course of fermentation dough is recommended press down 2-3 times and again to allow to approach. When dough will start to fall down, means, it is ready. For yeast dough preparation on 1 kg of a flour: water or milk 400-500 g, yeast 30-40 g, eggs 2-3 th, salts 12 g, sugar 50 g, fat 50 g.
Blend together water or milk, sugar, salt, eggs, oil. In the prepared mix to pour out the sifted flour and knead dough, so that it did not stick to hands. It is possible to do various products of the ready dough at once: peremech, shanga, gubadija, duchmak, etc. For preparation of the unleavened dough of 1 kg: flour 600-700 g, water or milk 200-250 g, sugar 30 g, oils 100 g, eggs 2 , salt. Dough for noodles and pilman. Flour to sift, to pour out on a board a hillock. To make in it deepening, where to pour cold water or the cooled broth, to add eggs, salt and knead dough. Dough should be abrupt enough and viscous. Ready dough to divide into 2-3 pieces, to felt balls and to allow to rest 15-20 minutes, then spheres to unroll till the thickness in 1-1,5 millimetres. The unrolled dough to strew a flour and to leave for 10-15 minutes for drying. For noodles on 1 kg of a flour: water or the cooled broth 200 g, eggs of 7, salt 30 g.
For pilman on 1 kg of a flour: waters - 300 g, eggs - 5, salts 20 g.